I like to think of March as the Friday of the seasons. All the mundane grey of winter is nearly over and everyone is looking forward to the weekend…er…spring and summer. Yesterday I smiled as I checked on the progress of my daffodils and tulips that were pushing themselves up through the earth. I had a nice chat with the happy faces of the primrose blossoms that come back to visit me every single year. In spite of my brown thumb. This morning I glanced outside my window and was baffled that the towering evergreens that always greet me were dusted in white. It’s not a lot of snow. At least not yet. It’s still snowing out there though. Maybe this March is actually a Wednesday. I take that back. We have to be at least more than halfway through this season. After all, Spring is officially starting in thirteen days. Or so they say. My Christmas Cactus has been telling me a different story. Right now it’s your job to pretend this is a really great photo. If you don’t, my iphone will be sad…we don’t want that, do we? She’s in full bloom right now. I was just so delighted with the beautiful gift of blooms she gave me, that I wasn’t paying attention to the message she was sending me. The holiday season is long past. (Well, unless you pretend to be Irish and are looking forward to the silliness that happens a little later this month!) Yet the weather, and my cactus don’t seem to know that. Who am I to argue with a Christmas Cactus? Apparently, the winter is here to stay for a few more days. Thank you for reading A Slice of My Life. I hope you enjoyed reading this as much as I enjoyed writing it. If you did like this post, why not consider “liking” my Facebook Page or signing up in a reader. I’d be thrilled and you would never miss a post! This entry was posted in Gardening, It's all about me!, Weather and tagged Christmas Cactus, daffodils, march, Mother Nature, primroses, snow, tulips, weather. Bookmark the permalink. We had this same rude awakening today! I was able to get off my hill before the road got too messy but I must say that I am very tired of this winter – I think I need a blooming plant to brighten up my window too. Amazingly, the skies were blue and the sun was shining when I got off work. You never would’ve guessed how the day started out! Well it was 60 in chicago today…crazy. I love how you mix photography with your writing. I’m a sucker for a good photo and it helps me to sort of visualize the rest of the story as well. Ha! 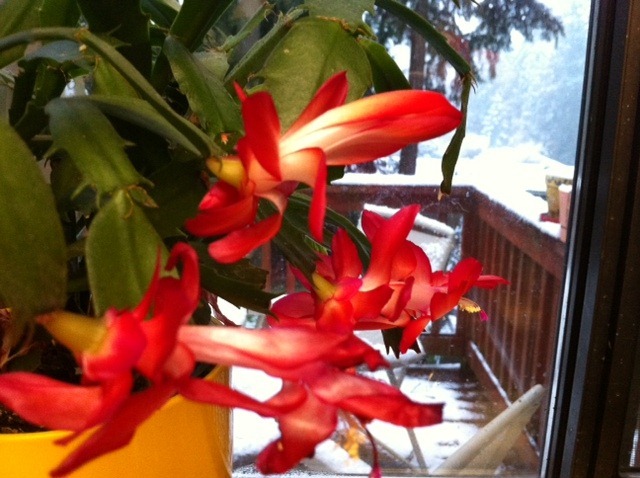 The Christmas cactus is a little season ‘challenged’ but beautiful just the same! Mine bloomed in December, and that is a miracle to me because I usually kill house plants! Thanks for your comment on my blog today Susan! Yes, raising teenage daughters is a hard job at times….and I don’t people really ‘get it’ unless they have daughters themselves.ps-did you know that your comments on blogger blogs are set at ‘no reply’ so people cannot reply directly unless they click thru to your profile? my zygote produced only a few blossoms over the season — but looks like it might be firing up again. 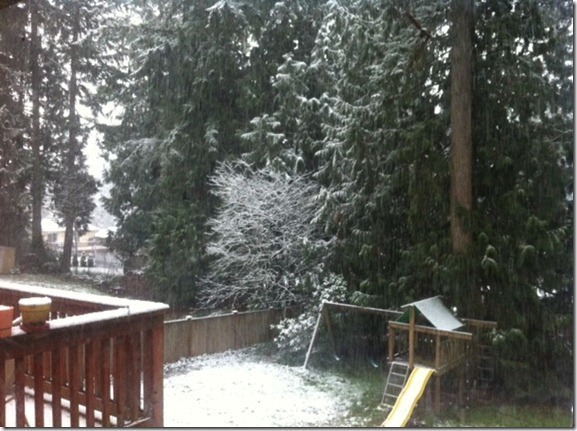 it was 25 deg one night this week – but yesterday it was 70 and wonderful. What a lovely plant. It seems everywhere, Winter has to have that last final fling. We had a bit of it here in Vegas last week, but it’s 70 something today and feels like Spring. My Christmas cactus just did the same thing…. lots of blooms in spite of having bloomed profusely just before Christmas…. and I see there’s yet another bud or two still to open! I love the thought of March being like the Fridays of the season. Very creative. What a surprise to see the snow. We are having delightful warm days, but I have spent the last two years at the first baseball game with near freezing temperatures. I hope the nice weather has returned to you. We got a quick, urgent dumping of snow a week ago, Friday. About 4 days ago, we warmed up considerably and have been walking around in t-shirts. Everything is blooming. That’s just unheard of in southern Ontario in March. But I’m not arguing either.